A group of Yemenite Jews prepare to board an Alaska Airlines aircraft in Aden, Yemen. The plane took them to safety in Israel. Credit: Alaska Airlines. With city lights dotting the night behind her, Dr. Dee Gaines, a neuropsychologist, sat for good reason — she’s very pregnant. But when Capt. Elgen Long, the last surviving member of a commercial flight crew that saved nearly 2,000 Jewish refugees stranded in Yemen almost 70 years ago, finished his speech, she felt compelled to stand. Her voice shook with emotion behind a microphone. Snow-haired and perpetually misty-eyed, Long, who turns 91 in August, bowed his head graciously in reply from a podium. Nearly 100 guests seated at tables applauded roundly in the backyard of a private home in Beverly Hills, Calif.
Long, a native of Oregon, told guests that returning to the City of Angels — a place he knows well from his past — was a privilege. After serving as a U.S. naval officer during the Second World War, Long attended the University of California, Los Angeles, on the G.I. bill. While in school, his part-time job was delivering telegrams door-to-door, often to movie stars, in the Beverly Hills area. Long’s brush with fate happened while working as a commercial-flight navigator for Alaska Airlines in the late 1940s. During a stop in Shanghai in January of 1949, his crew received a telegram from company heads issuing instructions to make for a British Royal Air Force base in Aden, a port city in Yemen. There, his crew took part in a daring rescue mission that would come to be known as “On Eagle’s Wings” — a reference to Exodus 19:4 — to help airlift tens of thousands of Yemenite Jews facing persecution and death out of Yemen and into Israel, a nation less than a year old at the time. After receiving permission from the head rabbi of Yemen to take off on the Sabbath, Long and his crew began making runs to Israel delivering batches of refugees. Their route, which called for a 20-hour flight day, was complicated by the inability to access air space over Arab lands. Upon landing in Tel Aviv, they turned right around, completing seven days of nonstop back-and-forth transport. Finally, they rested for one day. After a decent night of sleep, they made five more runs, clocking 12 trips in total. While unloading passengers in Tel Aviv, Long still remembers the reception his crew received from Israeli military personnel. “On Eagle’s Wings,” which also goes by the name “Operation Magic Carpet,” saved nearly 50,000 Yemenite Jews who have more than 750,000 descendants, including Gaines and her family. Another one of those descendants, Shahar Azani, a 41-year-old StandWithUs employee whose grandparents escaped Yemen, came across Long’s story while visiting an exhibit at a Jewish museum in Anchorage, Alaska, showcasing the role of Long’s flight crew in the rescue. Azani came across a copy of On Eagles Wings: The Untold Story of the Magic Carpet, a book Long wrote on his experience. “I knew then and there that I had to meet this man,” he said. Last fall, Azani and StandWithUs organized a trip for Long to return to Israel and tour the country he hadn’t seen since 1949. Over the course of a 10-day trip, Long told JNS that he marveled at the innovative nation that “he could barely recognize” from nearly seven decades ago. Capt. Elgen Long Long meeting with Yemenite refugees he helped save while visiting Israel in 2017. Credit: Shahar Azani. Azani said that in Israel, trip organizers offered Long meetings with high-ranking politicians, awards and appreciation ceremonies. But he had only one thing on his mind. 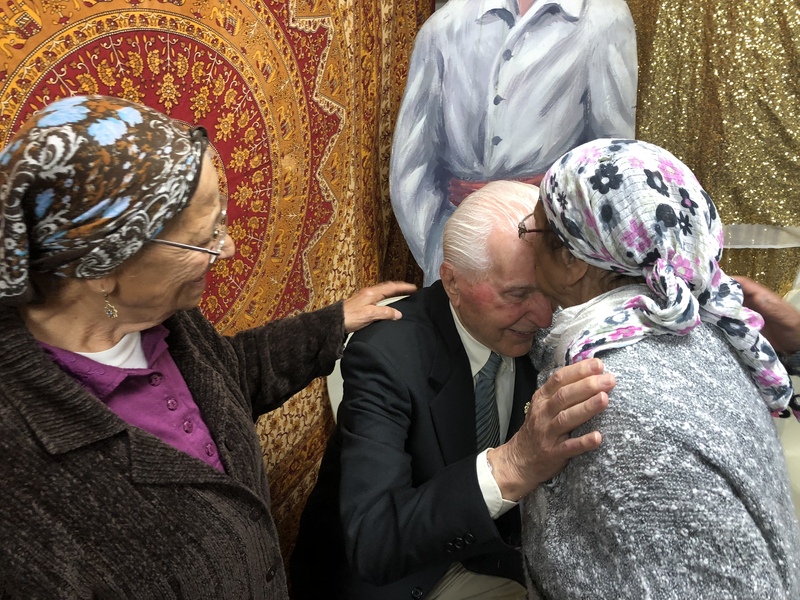 Reuniting with members of the Yemenite-Israeli community that he helped rescue was a joyous occasion for Long, but one in which he couldn’t help but think of his fellow crew members who didn’t live to see it.